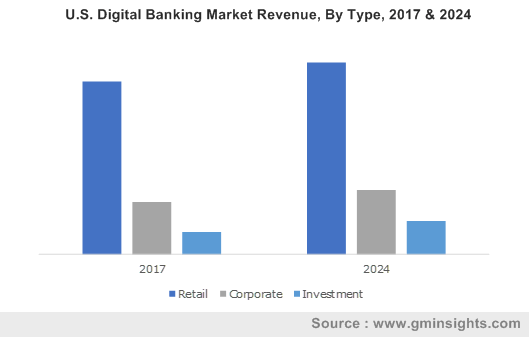 Digital Banking Market size was estimated to be over USD 7 trillion in 2017 and is anticipated to grow at a CAGR of more than 4% over the forecast timespan. The digital banking market is driven by the rapid adoption of online & mobile banking platforms. As the internet penetration & smartphone adoption across the world is increasing, banking institutes are shifting toward digital channels to deliver their services. These institutes are collaborating with fintech companies to develop more customer-centric products and provide a better customer experience. Moreover, the incorporation of advanced technologies, such as blockchain and artificial intelligence, will foster the adoption of digital banking services. Banking institutions are leveraging on AI to collect, report, and analyze large chunks of data for extracting meaningful insights about customers to meet their requirements. Banks are embracing technology to reduce operating costs are stay competitive in the digital banking market. It prevents banks from investing in expensive legacy hardware & software to keep these systems up to date. It helps banks to retain their customers by offering an improved customer experience and personalized services at lower costs. It also provides banks with a 360° view of their customers. The increasing threat of cyber-attacks is hindering the adoption of digital banking market. Fending off cyber-attacks is one of the major challenges faced by the banks across the globe, considering the sensitive nature of the customer information that they possess. As the cybercriminals are launching more sophisticated and frequent attacks, the number of major data breaches are set to increase over the period. Retail banking is estimated to account for over 75% share in the digital banking market. The growth of the market is attributed to the wide adoption of electronic & mobile payment solutions among the users. As the market dynamics are changing and customers are becoming more empowered, the banks are also developing new business models to cope up with the changes. Moreover, the increasing need to integrate or connect distribution channels to reduce the cost, optimize efficiencies, and provide better banking experiences to the customers are also encouraging the adoption of digital banking among the retail banking sector. 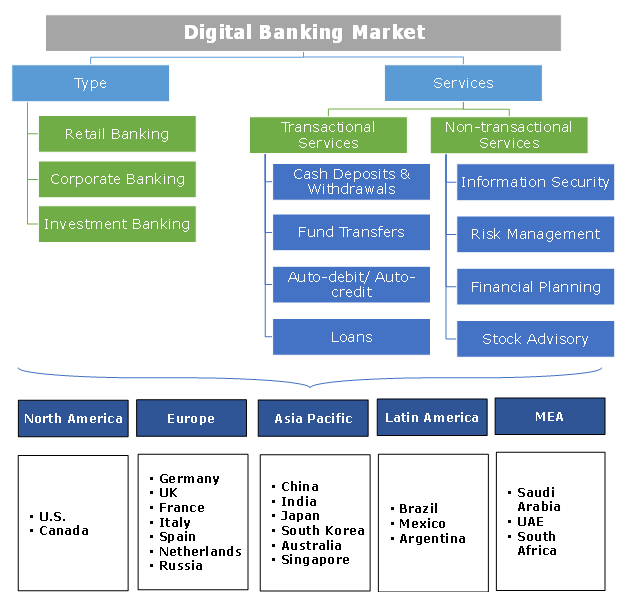 Investment digital banking market is projected to grow at a CAGR of over 8% during the forecast period. The development of new regulations, such as Dodd-Frank Act, EMIR, and Base III, is encouraging the adoption of digitalization among the investment banking sector. Furthermore, the increasing electronification of the asset classes is also driving the adoption of the digital banking platform across the investment banks. Transactional services are dominating the digital banking market with over 90% share in 2017. The banks and consumers are more becoming more inclined toward faster, safer, and convenient payment methods. Demographics across the world are shifting toward digital payment methodologies. As the younger generation (aged between 16 to 34) is heavily influenced by technology, their buying habits & expectations are formed through the immediacy of smartphones, internet, and modern conveniences. Businesses and consumers are interested in faster, safer, and more convenient payment methods as cash is becoming obsolete and credit cards are being phased out. The digital transactional services enable faster payments and provide a strong value proposition for any consumer. The digital transactional service lowers the costs for businesses. The more the payments are processed digitally, the lesser expenditure is there on paper and postage. Offering digital payment also helps businesses to improve customer retention. A customer is more likely to return to the same e-commerce site where personal information has already been entered and stored. Asia Pacific is leading the digital banking market with over 60% stake in the global market. The market growth is credited to the high-volume non-cash and digital transactions in the region. The widespread adoption of electronic & mobile payment solutions in China is the primary factor supporting market growth. According to the People’s Bank of China, the country handled more than 125.11 billion non-cash payments transactions with a value over USD 530 trillion in 2016. Mobile payments maintained a rapid growth momentum in China in 2016 while online payments were also growing rapidly. China’s mobile payment business saw 25.71 billion transactions in 2016, which is an increase of 85.82%. The supportive government policies and initiatives in the emerging economies including India and China also foster the digital banking market. The Europe digital banking market is exhibiting a stable growth rate of over 3% during the forecast period. The growth of the market is driven by the rapid surge in e-commerce. The high adoption of mobile banking & internet banking in the region is promoting the adoption of digital banking solutions for retail payments. Approximately, 38% of the smartphone users in the region use mobile applications for operating their bank accounts. The Netherlands is leading the mobile banking adoption with more than 90% of the smartphone users in the region using mobile banking services. 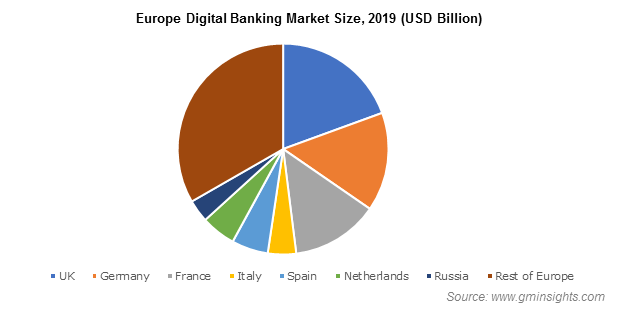 The digital banking market is analyzed to be highly competitive due to the presence of both multinational companies and fintech start-ups in the space. These players are mainly focusing on collaboration with baking institutes to gain the market share. The players are adopting both organic and inorganic growth strategies to capture the market share and expand their customer base. The multinational companies and banking institutes are acquiring fintech start-ups to develop their own omnichannel digital banking products to serve their customers and reduce the churn rate. The finance industry remained in a comfortable position for decades with a low customer turnover and almost no regional competition along with good relationships and trust being the selling points without much intervention from regulators. However, the new competitors from adjacent industries and financial technology start-ups are flooding the market with innovative, technology-driven deviations from traditional business models. Consumers are also flocking toward digital challenger banks due to their remote functionalities. Hence, large banks are investing in digitalizing their financial offerings to create a distinction from these financial start-ups and other technology players. The smaller players are also responding to these changes by catering to a niche customer segment. These developments are changing the banking landscape.